The DONT WALK launch party preview jumped out from the screen, leaving me instantaneously intrigued, confused, and excited. Last Thursday, St Andrews most elusive fashion show held their annual launch shindig at Forgan's, and their event delivery exceeded all my expectations. The launch party was split into two parts. A dinner, starting at 7 PM, followed by an after-party which ran till 2 in the morning. The launch party mirrored the exclusivity which typifies DONT WALK. Both the dinner and after-party were by invitation only, and further distinctions were made between those invited to both the dinner and after-party, and those solely invited to the after-party. My initial reaction to hearing that DONT WALK would be extending its invite-only policy (usually applied only at its main event) to its launch party was one of apprehension. However, upon entering Forgan’s, my scepticism immediately disappeared. There was no line to the venue. The dance floor was lively and full, but not packed and chaotic. I could weave my way through the crowds with relative ease, and I spent the entire night constantly bumping into old friends and making new ones. In short, the launch event at Forgan’s more than made up for the lack of intimacy at DONT WALK’s last launch party - Crosswalk. Furthermore, the event’s ambience was simply electric. Everyone was so lively, joyful and festive and the phenomenal DJ sets, which can only be described as an eclectic mix of modern hits and everyone’s favourite classics, kept partygoers dancing all night long. Honestly, is there anything better than dancing, laughing and singing along to TLC’s No Scrubs, and all your other favourites from the late 90s and early 2000s, at 1 in the morning? Yeah, I didn’t think so. Now, don’t get me wrong - this wasn’t like your average night out at the Lizard. 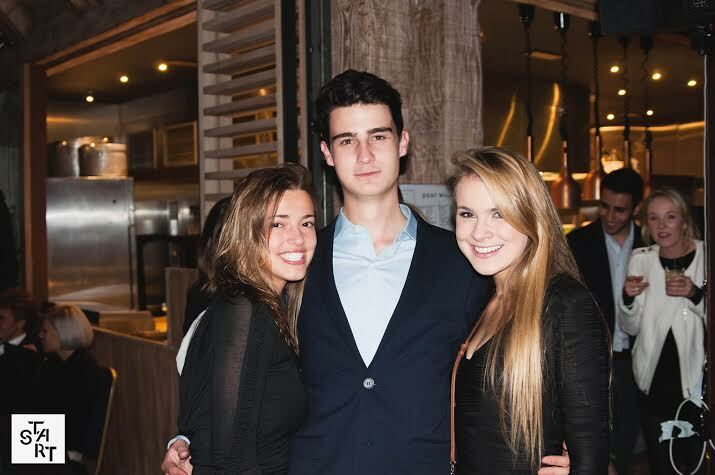 The event embodied professionalism and glamour, and it was clear from the start that DONT WALK was intent on making their mark on Forgan’s, and distinguishing it from your typical night out on the town. Mannequins lined the entrance of the restaurant, and a large TV display - at the front of the venue - flashed black & white images of the DONT WALK logo and models on a constant loop. Efforts were also made, in regards to sponsor representation. A large Tilt flag hung from the wall, and an abundance of Vita Coco cartons could be seen scattered across the various tables. Moreover, the DONT WALK crew and their guests were dressed to impress. As is typical of the St Andrews fashion scene, the boys donned their finest suits and ties, while the girls rocked their favourite little black dresses, sky-high heels, and bold red lips. The DONT WALK launch had all the glamour of a fashionable night out, coupled with the quaintness which embodies our small coastal town in the Kingdom of Fife. It was an event to watch, and be watched. Indeed, it was almost like the DW team knew what I was thinking. In the midst of gettin’ crunk to Fergie’s London Bridge, I turned to see a rather large board with the words “DONT WALK, DONT WATCH, 2016” plastered on it, and a CCTV sticker firmly stamped over the year. I would certainly say that DONT WALK’s launch, coupled with the handful of Vic events the organization has hosted since the beginning of term, has certainly set a precedent for the rest of the year to come. DONT WALK is here to take St Andrews by storm.